It is perhaps hardly necessary to-day to explain what a Japanese sword-guard is. 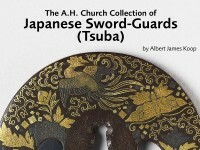 Suffice it to say that of all the metal mounts which served to strengthen and decorate the Japanese sword or dagger of a former day, the Tsuba still easily maintains its hold on the affections of collectors, as it did with Sir Arthur Church, whether owing to its greater size as a field for decoration or from the fact that interesting early specimens of it are, unlike the other mounts, available in sufficient quantity to make it worth while to form a comprehensive collection. In the matter of the subjects depicted Sir Arthur’s predilection was for the botanical or the purely conventional and geometric, as against the animal or human form. Hence, if we are to regard his collection as a representative whole, what must be called a superfluity of material in the groups specially catering to his needs (such as the Chōshū, Kinai, Akasaka, Itō, etc. ), and a corresponding shortage in others. At the same time he would appear to have felt it his duty, particularly in the later years of his life, to make the collection at least in some degree representative of all types; and as a result there is not a school of importance, whatever its favourite class of subject, that is not illustrated here by at least one example- and that usually a particularly good one.